These are the sunglasses I got at Shabby Apple because I won a gift card through a blog giveaway. At first it was fun to try to see what my $50 would get me, but the quality looked so dubious and most of the clothes were too trendy for me. So I bought sunglasses with curlicues on the side. Then I made a little bag for them from one of my husband's dress shirt sleeves. I could mention that the shirt was worn through in the collar and cuffs and I had harvested the buttons already, but it would be funnier if you imagined him pulling a dress shirt out of his closet with one sleeve chopped off. The shock! I did not pad the little sleeve case, so I'm not sure it's a practical way to keep the sunglasses in my cavernous bag. But the little jewel-like orange buttons are so fun! And hello, sunshine! I'm happy to put on sunglasses again. Hey, it's white outside again today and I'm working on winter clothes, partly because it took me all winter to figure out what we needed and partly because we wore out our winter clothes and even though it's technically spring, we still need those clothes. You can go now, Winter. I made myself a pair of flannel pajamas. I love the birdie flannel, but JoAnn's didn't have enough for both shirt and pants, so I used aqua houndstooth flannel for the pants. With a little orange-flowered ribbon tag. I used black grosgrain ribbon, free from the fabric outlet with my last purchase, to finish the hems, trim the pockets, and make a drawstring. I loved how these little black buttons complemented the flannel, but I needed one more button. I decided to simply add another pretty button - why on earth do all 5 buttons need to match? They all look good together, and suddenly, I see a middle ground between seeking matched buttons and mismatching buttons for the hobo/boho look. Since I'm practically middle-aged, I've noticed I really go for the middle ground on every issue. I also made my husband a pair of boring grey pajama pants and fleece leopard print lounge pants for myself. Too boring to photograph and too private to model. And here is Christy getting me back on track with my wool socks. 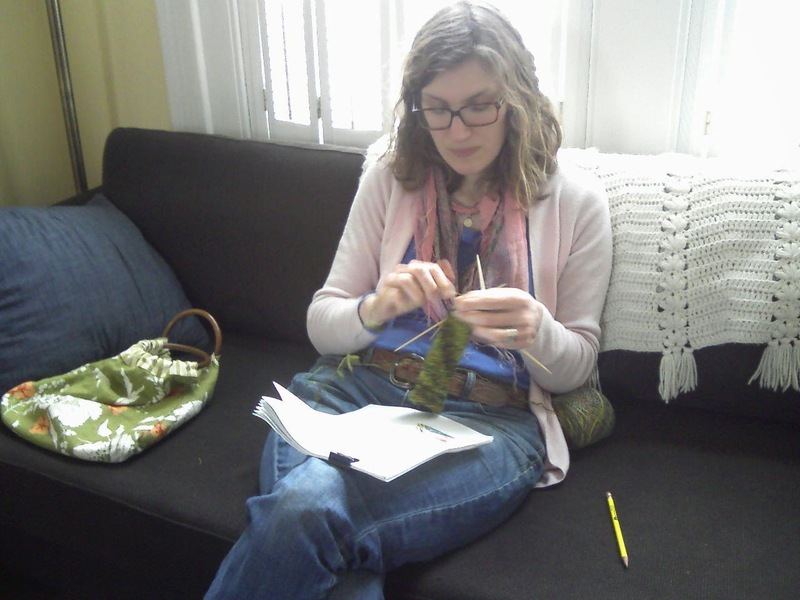 She's an excellent, patient teacher and I've never seen anyone knit as fast as she can. When I get past the heel, I'm going straight back to Christy's house to drink tea again and let her coach me through the next steps. The best way to knit! When the idea for this post first occurred to me, I thought it was silly and trivial. But it has taken me years to perfect the skill of getting out of a store without a plastic bag! So many cashiers want to be generous and helpful when they insist I take a plastic bag, so I want to be nice in return. And very, very firm. Consequently, I decided to write this post to share the actual lines I use when I refuse plastic bags. Look, I'm not morally opposed to plastic. There are useful plastic items in my home. But I am opposed to the thoughtless use of plastic when there are easy ways to avoid it. Plastic is petroleum-based. It doesn't biodegrade. It gives off harmful chemicals. My normal approach when I'm shopping is to say hi to the cashier and as soon as he/she touches the item I'm buying, I say clearly, "I don't need a bag." Clear diction is important because I'm introducing a new idea into the standard shopper/cashier interaction. Most of the time, this line works, especially if I am obviously holding a cloth bag. "It's just water - it'll dry. I really don't want a plastic bag, thank you." "I really don't want a plastic bag. It won't leak. If it does, I'll take the blame. Thank you for taking such care with my groceries." "I brought my own bags - I'm happy to do the bagging." "I have way more plastic bags at home than I can use. I'm overflowing with plastic bags." "I'm trying to cut down on the amount of plastic I use." "I've got a bag in the car." "I'm sorry - I didn't realize you were going to throw it away; I'll take it home and use it." I'll leave you with this anecdote: my husband bought a pair of shoes at the mall recently. I was standing nearby as he paid for them. I was keeping the puppies (children) under control. My husband clearly told the cashier he didn't need a bag - it was one shoe box and we knew we were walking the puppies directly out to the car and going home. At the very end of the transaction, just as he was about to hand the shoe box to my husband, the cashier suddenly threw the box in a store bag, muttering "just in case." We were dumbfounded. We collected the bag in silence and walked away. Then we began to giggle and invent the scenarios to go with "just in case" the whole way out to the car. Probably there was a bug in the box - the bag could keep it in. Probably the roof would fall in. Maybe the cashier earned commission on the bags he issued. Or maybe he was just using the bag instead of a "paid" sticker and was worried that we would lose our receipt between the cash register and the door. There are rare occasions when it's just easier to take the bag - I'm really not a preacher or a perfectionist. Do you have more stock answers (or pet peeves) to add to the bag issue? Our MYF (Mennonite Youth Fellowship) is going on a service and learning trip this summer (this project). They needed to raise some money for supplies for the houses they are going to be repairing. So they held a dinner and benefit auction, and I donated a patchwork pillow and a clothespin bag that I made. Because I love these kids and I love the project. I made another donation by buying these glass cosies. A drinking glass sits down in the cosy, which acts as a coaster and identifier in one. Clever, no? Crocheted by my friend Myrna, and packaged beautifully with a set of vintage napkins. In church this morning, the MYF announced that they raised almost $8,000 with their auction and dinner. I'm so pleased. Here is the patching roundup I mentioned, with all the projects categorized by Leila and Rosie's collection of pretty/happy/funny/real. My hotpads were looking pretty sorry and then I went and scorched one, so I made a new pair from my cutter quilt. I covered up some split seams with patches and highlighted them with handstitching in red perle cotton. It's so nice to work with pretty things that are also useful! This handtowel went from serviceable to wonderful when I patched up a hole and a stain with some vintage kitchen curtains. And Genevieve can wear her tights again! I darned a hole with matching green thread. I'm so pleased to extend the life of these tights. I offered to cover up the brand name of Ben's backpack with an applique. He loves the patch because it has wheels on it, I love it because it's a little offbeat. Apparently, the vintage pillowcase that I used for my pajama waistband was rather weak. So holes are appearing in the waistband. For now, I'm just slapping patches on them, embracing the shabby chic look, and hoping for spring pajamas. Then there is the patchwork tablecloth. The mystery terracotta fabric gets very heavy and stiff when it's wet, so some of the seams of the patchwork have pulled out from the stress. Also, I don't use wide seam allowances, so there wasn't much communal fabric for each seam (I can just picture each partner yelling and clinging to no avail. . . ). So, I stitched on lots of patches to help the torn seams. The back of the patchwork looks rather cool, now. Maybe I'll flip the tablecloth to get longer wear out of it between washings. . .
Then, my friend Jan told me that the acid (tomato) and base (milk) must be similar amounts, and the acid must be added to the base. However, I was not fond of the pale pink tomato soup that resulted from so much milk added. Rebecca started messing around in her lab (kitchen) and reporting results. I started independent testing to verify her results in my lab (kitchen), with the results verified by a consumer panel (family). Look, if tomato soup curdles, it's still tasty. It's just that the milk turns into sticky little curds and the soup looks freckled, not creamy. I've never actually thrown out a test batches, just grumbled my way through it. To make tomato soup, I simply heat a quart jar of this tomato soup base while I'm making a white sauce in a saucepan. 1-2 Tbsp. butter, melted (maybe a little mushroom or onion in here if you like), with 1-2 Tbsp. flour whisked in and then cooked together until bubbly. 1 cup warm milk whisked in and whisk whisk whisk over medium-low heat until it steams and thickens. I usually prefer straightforward cream of tomato soup, but you can add some basil or other herbs, a little cooked rice, or, as mentioned above, something like mushrooms, onions, garlic, or celery in the white sauce. Serve with crackers, grilled cheese sandwiches, or cheese quesadillas. Just to muddy the research, how do you make homemade cream of tomato soup? My friend Christy asked me to show her how to patch little boys' pants. How often do we get to share our skills and methods with our friends, beyond sharing recipes? This was so enjoyable. While our kids ran around together, Christy and I sat down at my machine and I showed her what I do. There are other ways to patch pants, mostly considered more "correct" than my method, but my foundation for this casual tutorial is that I have been patching pants into longevity for several years now. I unpick the side seam of the holey pant leg so I can fit the holey area under my sewing machine needle. I put a rectangle cut from flannel or other soft fabric under the hole, wrong side of pants. I stitch it down, being sure to stitch through the hole a few times. Then, on top of the hole, I put a patch that will be visible when the pants are on the child. 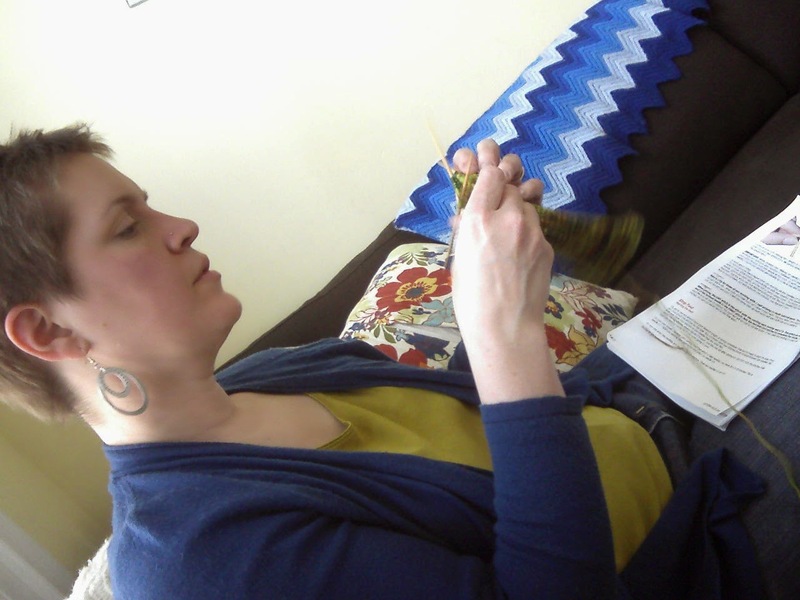 Sometimes I use a pinking shears or a tight zig-zag stitch on the raw edges. I stitch the patch down in some manner, again being sure to go over top of the hole at least once, connecting the weak places to the strong new fabric. Then, I sew up the side seam that I unpicked. Done! The way Christy attached the underneath patch gave me an idea for a holey knee in Ben's jeans. I used navy thread and just sewed back and forth in somewhat horizontal lines, attaching a denim patch that was under the hole. I love this look! I will definitely use this for adult pants. I also tried another idea on these jeans. They had two flat-fell seams on each leg (most pants have at least one regular seam). It's not worth my time to tediously unpick a flat-fell seam! So, instead, to reduce the bagginess and get to the holey knees, I just cut out the interior leg seams in a big U! After I patched the knees, I sewed up the seams like normal, not flat-felling them. 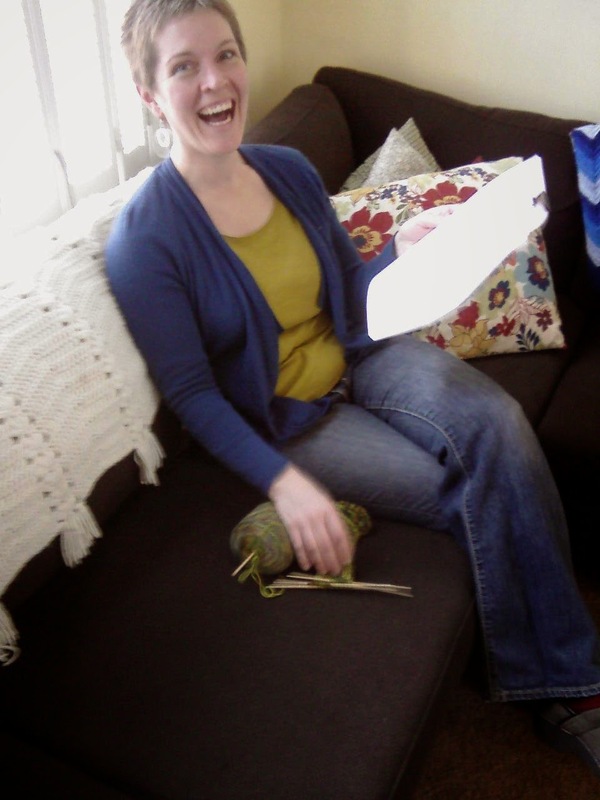 Next up: a visit to Christy's house so she can tutor and coax me through the socks I started knitting 2 years ago. Hooray for friends with skills!